At the age of 21, on the 14th of October 1996, one of Irelands most popular singer-songwriters Mundy released his debut Album ‘Jelly Legs’ on Epic Records-a subsidiary of SONY. The critically acclaimed debut produced by ‘Youth’ went on to sell a respectable 60,000 copies around the world. This year will mark the 21st Anniversary of the said album and also 21 years since his song “To you i Bestow’ appeared on the Hollywood block buster movie ‘Romeo and Juliet’ by Baz Luhrman. The movies soundtrack, cherished by many, sold over 11 million copies around the world. Many of Mundy’s core fans believe that ‘Jelly Legs’ is his masterpiece to date despite the other popular albums that later would reveal themselves. The album featured the songs ‘Pardon Me’ and ‘Life’s a Cinch’ which also got MTV and VH1 rotation plus the highly requested song ‘Gin and Tonic Sky’ which many fans say is one of his best songs, even James Dean Bradfield from the Manics thought so at the time. Mundy has decided to mark this occasion and to celebrate the album by reforming his old band with Guitarist-Steo Farrell,Drummer-Cion O’Callaghan and Bassist-Shane Fitzsimons. 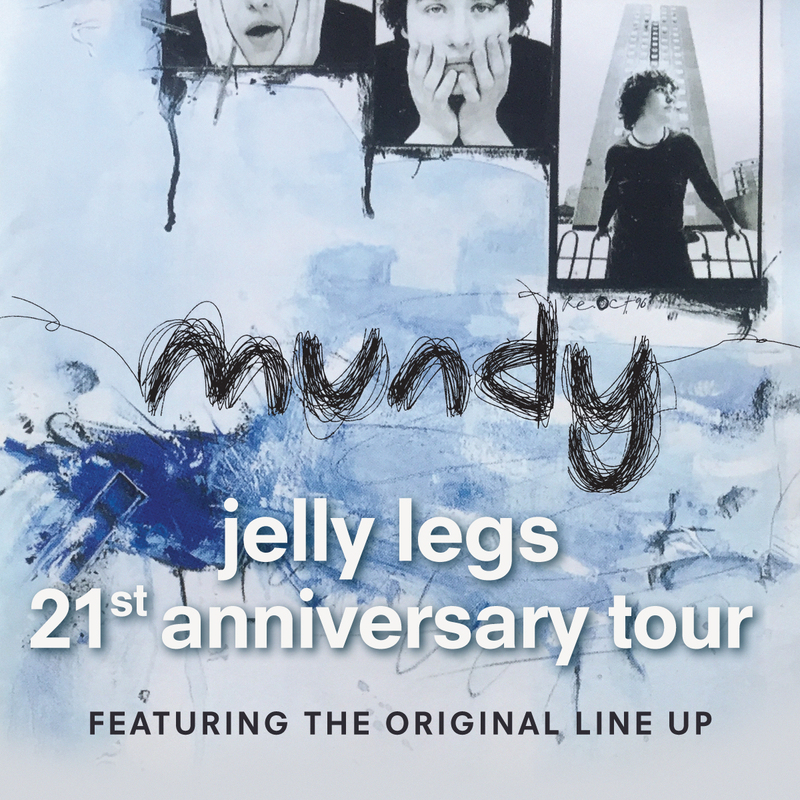 The name of the tour will simply be called ‘Jelly Legs 21’ and Mundy is hoping to add some extra layers to make it a very special celebration. The band toured France and the U.K extensivley and the USA sharing bills with Van Morrison,Manic Street Preachers,Cast and the Stereophonics to name some. Mundy is in current talks with Sony music about a reissue of Jelly Legs adding some rare bonus tracks from that era.